Moonraker Shuttle Model -- Finished! Discussion in 'Studio Scale Models' started by PHArchivist, Jan 4, 2006. I know its a fairly obscure subject, but does anyone know the scale of the studio models? I have the 1/72 shuttle kit. and some Moonraker decals... Curious how close to studio scale it is. Update: All done. And glad to see its not such an obscure topic afterall. Its been a joy. Here are a couple of the earlier kits, I had these myself. Aurora/Polar Lights released a set, with decals. Not sure on the scale. PHArchivist, Is your set of Moonraker decals in 1/72 scale? I honestly don't recall how I stumbled across them. They are clearly Moonraker, but at first glance don't seem to quite match the markings in the movie shuttes. Though so far I've only taken a passing glance -- I'm still sort of in the research mode (hence this thread). I've only just stared the kit, and very quickly held up the decals to the parts, but haven't fully studied the decals versus kit match-up. There was a model at the Planet Hollywood in Vegas a few years back. Though as sith most PH stuff, you have to question its authenticity. Sadly, mmy pics of it are not as good as I hoped. You can translate entire webpages at http://world.altavista.com/. I've also seen the Moonraker shuttle at a few of the Planet Hollywoods. They all looked a little "off" and knowing that most of the models at PH were not the real thing, I didnt bother to photo them. I've done a fair bit of research on the Moonraker effects, but have never heard mention of the shuttle model size. Translated, the page says "Length 56 m, Scale 24 m"... I'm going to guess they mean Scale is 1:24? The overall length of the entire shuttle stack with boosters is about 56 meters... so a 1:24 orbiter would be about 1.6 m long (5 feet). If I recall correctly, the 1979 Airfix catalogue featured a piece about how the Airfix kit had been used for background and smaller scale shuttles in the movie, and that Airfix produced a full stack Moonraker suttle; I *think* that Revell did a full stack and lone orbiter for the States, but I'm not 100% certain on that. I saw the orinial large Moonraker 5 shuttle a good few years ago in NJ at a small bond convension. I didn't have a camera or anything with me, but I recal that it was a good bit bigger than the 1/72 Revell shuttle as I have one of those. I was to say it was about 50% bigger, maybe 1/50th or 1/48th scale, but I really can't recall how big it was, could have been bigger. It was the hero model for the in-space shots and was the largest of the models built. So I'd think the 'full stack' miniatures were a good bit smaller. I have the 1/72 shuttle kit. and some Moonraker decals...Â Curious how close to studio scale it is. Cool - so it has been on public display... Wonder if any one else saw it/photographed it... One can only hope. A good view of the model. "When work on the film began, NASA had in fact not yet officially "finalized" the design of the Space Shuttle. 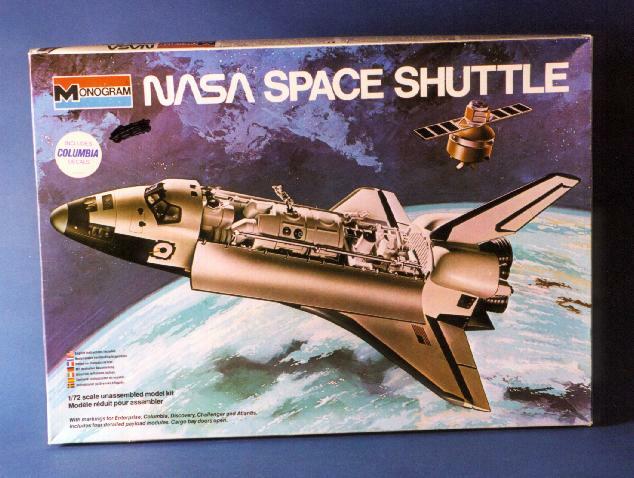 Fortunately for the production designers, there were subsequently no visible changes made to the shuttle's design, making their rendering of it accurate." There is a noticable difference in the shape and rake of the nose, cockpit window area and roof between original and newer shuttle model kits. The first models put out by Revell and Airfix in the late 70's have the same body lines and window shape as the Moonraker models. 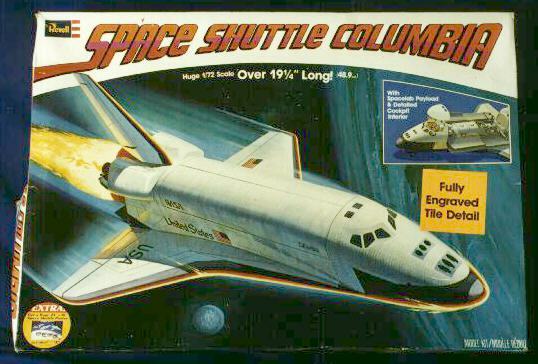 If your going to build yourself an accurate 1/72 Moonraker shuttle, you should really use the first Revell Columbia kit. The studio models were larger than the 1/72 scale indeed close to the 1/48 -1/50 as mentioned. Here is a pic of moonraker 5. Awesome contribution, Paul -- THANKS. Check this out -- here's the notorious Planet Hollywood model. Note something missing.? As I work on my own model, should I display it here, or in the General Modeling Forum? I'd show it here. I'm sure that I have some photographs from a Bond exhibition in Glasgow about 6 years ago. I'll try to find them and scan them for you. They were taken from various angles as I too was going to attempt a shuttle in the 1/72 scale. BSG Shuttle GAL 356: Do we really need another?